Do You Have Your Papers, Mr. Kent? I saw this on Coyote Blog and had to swipe it. 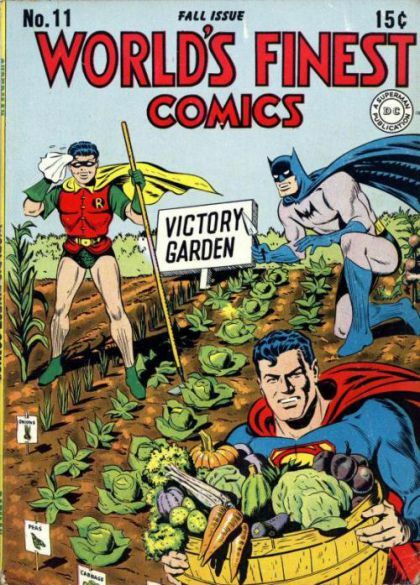 I am sure that Superman would be a super-productive gardener, but there are likely much better tasks to assign him for which his comparative advantage is much greater. What also occurs to me is that Superman, being from the planet Krypton without proper papers, is an undocumented worker. Imagine if he decided to do every job he could. No matter what he was paid, it would still cost jobs that would otherwise go to, oh, everyone else on Earth. The planetary economy would be shattered within days. Then again, we could all just lay about and do nothing while Superman takes care of everything. I doubt even the strongest critic of the welfare state would mind spending all his time by the pool with a 5000″ TV while Supes takes care of everything. Posted on September 20, 2012, in Economic$, Fun Stuff, Hey! Comix! and tagged Batman, comics, Coyote Blog, economics, fun stuff, Superman. Bookmark the permalink. 1 Comment. Supes was always my least favorite comic book hero. He’s just so…. Boring. He really can do everything, so what’s the point?